Home/Shop Dog Supplies/Dog Gear/Dog Harnesses/No-Pull Dog Harnesses/Deluxe Easy Walk No-Pull Harness: Padded & Reflective! The Deluxe Easy Walk Harness works instantly, effectively, and comfortably to make leash walks more pleasant and safe for you and your dog. The Deluxe has the same great benefits as theoriginal Easy Walk, but includes neoprene padded straps and highly visible, reflective detailing. Gently stops leash pulling: The leash connection ring is located on the center of the chest strap. When your dog pulls on the leash, he or she will be guided back towards you, which naturally and easily discourages pulling while preventing pressure on your dog's sensitive throat/trachea. 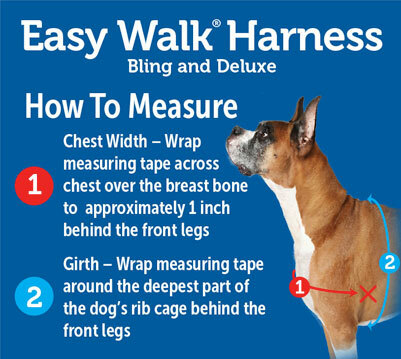 The Easy Walk features a martingale loop closure on the chest strap that helps prevent shifting and increases effectiveness. For your dog's comfort: The Deluxe Easy Walk includes padded, neoprene-lined straps to prevent your dog from chaffing. A quick-snap buckle on both the shoulder and belly straps make it easy to get the harness on and off your dog. Four adjustment points provide maximum comfort and a reliable fit. Reflective for safety: Visible up to 1000 feet to help keep your dog safe on walks. Includes detailed fitting and use instructions. For the standard Easy Walk Harness in non-reflective (and also sized for very small dogs) without a leash, click here. Wow. I have had trouble with my bull mastiff pulling since I adopted her a year ago. I tried everything including training. Nothing worked. It was so bad I didn't even walk her in the mornings with my other dog because it was just too difficult. Until I got this product... Night and day difference. (Mind you, I also paired it with a PetExpertise hands free leash product). I can finally go on walks and jogs with her and it hardly even feels like she's there at all. Thank you for making this. Just thank you. Changed both of our lives. I couldn't be more pleased! The harnesses work wonderfully. My two Goldens are 90+ pounds each and very strong. One of them has done me a lot of harm in the past (broken ribs, sprained wrist, stitches in my face). I put the harness on him and we went for a walk and I felt as if I had complete control. I can't thank you enough. And I know he's pleased because now he gets to go out walking with his mom again! We are very happy with the easy walk harnesses. We have tried 4 or so different products (even Halti and Gentle leader) and the pups were more determined than ever to keep pulling. Well, the harnesses have them beat. I cannot tell you how amazing this product is. I bought one for my min.pin. and saw some great results. We have been thru' obedience, but he still wants to pull. Once I put this on -- it was like a miracle! I was skeptical, because so many other products claim to work and don't. The head collar is not accepted by my dog (who was a rescue and freaked out by "confinement") and many others that I know give up easily when their dog fights the head collar. The following week, I tried it out on one of my obedience students who has a very strong Rottweiler and another couple with 2 German Shepherds. They were immediately hooked as well. This harness is GREAT! Thanks for the quick shipment. I just ordered another one for my parents' dog. WOW!! What a fantastic product. I got it for my mother's puppy - who gets no discipline in life (Ha!! ), and was a terror on the leash. She's a Pug/Bichon mix who thought that she was a sled dog. I have been recommending it to my friends with 'enthusiastic' dogs. I sent them your website too as you have the largest selection of colors and sizes.